a bowl full of sunshine~lessons from the wild. Grumbly to the bone the other day, I prodded myself and my small people out the door in hopes of letting the fresh air breath light into my bad mood and make everything okay again. Or most everything. My own lack of gratitude for a perfectly wonderful day and my hope to recapture it out in the sun pails in comparison to the weight and worry of those experiencing very real challenges and trials, as it does face to face with tragedy on the scale of marathons and countries and the whole hurting human race. But those things I could manage to control, I knew, might be helped by some time outside. And because I am easily influenced by the natural world towards happiness, and because a quick glance around my day to day life always serves to remind me just how small my own sometimes frustrations are, we quickly felt up for trying something new and something fun~dandelion jelly. I have been keen this spring, more than ever, to pay attention to some of the weeds out here on the farm that can be useful. This drive is mostly prompted by my slowly gathering desire to make more of our own medicines, but the truth is, spring weeds are often also great to eat. The stinging nettle has been a part of our spring diet since a neighbor went out into the woods with Andre the very first spring of our marriage and collected some with him, returning back to our little mountain cabin to prepare them for dinner, much to my pregnant mind’s skepticism. Now, so many years down the road, they are a regular part of our business harvests too, and one of our top sellers. We even start crave them come early spring, and we make batches and batches of pesto with them, both to eat and to freeze, while we also try to dry enough of them to make a wonderfully nourishing tea to drink throughout the year. We love them. But besides nettles, this spring I am noticing that cleavers grow like crazy out here too, and can be a healthful addition to smoothies or juiced and used to soothe the skin in case of injury, and made into a tincture for the lymphatic system. Wild violets spring up and while they last, they add their cheer to our now lettuce based spring salads. Plus they are one of the first sweet treats we can just go outside and nibble on, slowly inching us closer to the even sweeter and more snacky snap pea and strawberry season. 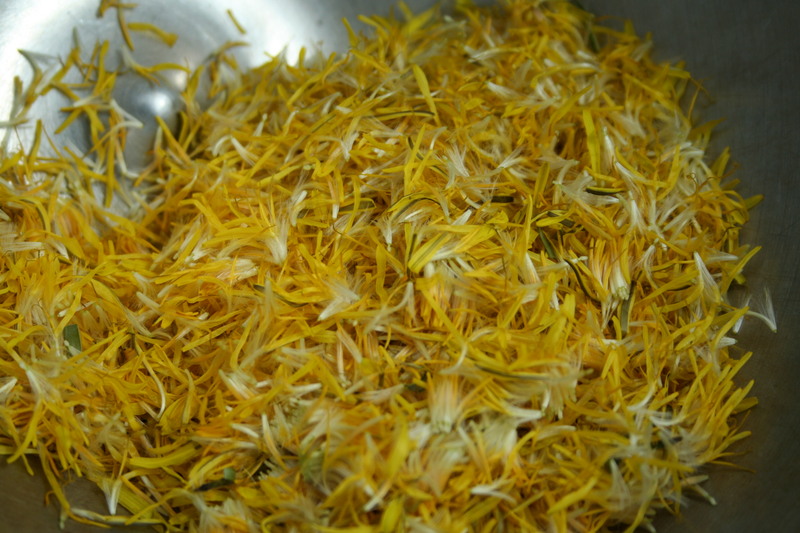 But of course, the most ubiquitous of all these weeds to be so long revered and used is the dandelion. Eat the leaves early, before flowering, and they can stimulate a body grown slow and weary from winter. Use the flowers for jelly and wine to capture something sweet and pleasurable. And if you go the mile, you can harvest the roots and they will do a fine job of helping heal you from the inside. Always a delight for children, with seed heads that are wish makers extraordinaire–these are a friendly plant. As we gathered a basket full of these flower heads and then sat in the grass and painstakingly but leisurely pulled off just the petals for making the jelly, the smallest among us dig in nearby dirt, unearthing salamanders and earthworms and giggles, while the older boys sat chatting with their mama about the simplest but sweetest of things. In that moment, I could already taste this jelly in my mouth, this jelly that tastes like almost nothing at all. It is simple and sweet, like spring. Like our days. These often maligned flowers really did brighten my spirits in both the playing with them like I would were I a child again, and in the slow, peaceful work they brought me, side by side my own children on a sunny spring day. But mostly, they did this through the reminder that even weeds can have a purpose too. Right now, in spring, this theme is still a pleasant one to take meaning from, and I see it touching some of my closest friends who are also like making metaphors. One friend posted a picture of a thistle sprouting up on her farm and hearkened it to a symbol of perseverance. Another friend’s daughter brought her a bouquet of these same wonderful yellow flowers alongside a bouquet of tulips and gave her pause to consider the beauty in all people. And the herbalists amongst my crowd, of course, fully appreciate the deeper wisdom of weed culture. Like I find comfort in a bowl full of sunshine, I find comfort in finding meaning, and I find even more comfort in seeing that this meaning is out there, rising from the earth, finding us all. Come summer, we will be knee deep in weeds that will temper the growth of the plants we are purposefully cultivating in our fields if we don’t take the time to get rid of them. They will inevitably take on a different, less pleasing meaning then. But right now, in all their wild glory, they remind me that I have the blessing to be at ease. That really, I have the duty to enjoy it all. That this is the only proper response to a moment offered to you from this universe that is not wrought with hardship, not burdened or traumatized by forces outside your control. That by being in joy if I can, I am being most sympathetic to those who can not. Take your joy and do not be ashamed of it, because it is your moment. Find your care and concern for the world at large and those you know who need it–and yourself when it is your turn–from the deepest part of your joy. Then, abandon to the dandelions your more trivial concerns. This way, the weight of your worries can find their most realistic proportions weighed against the more strangling weeds that come into this world. We all have things to grumble about, and we are all legitimately and honestly free to experience them, but the perspective of weeds is this–most things are not as bad as they may appear. If we are not ourselves in the darkness of a deadly nightshade patch, then we should try to find our own surroundings as pretty as we can. We should take comfort in knowing that most everything around us in this world is useful and good and full of light, and then move forward from that point, that understanding. There is solace to be found such. There is, as this Wendell Berry poem so often comforts me with, peace to be found in these lessons of the wild. And there is, if you can look closely, sunshine amongst the weeds. What a profound post. Lovely. This is great! 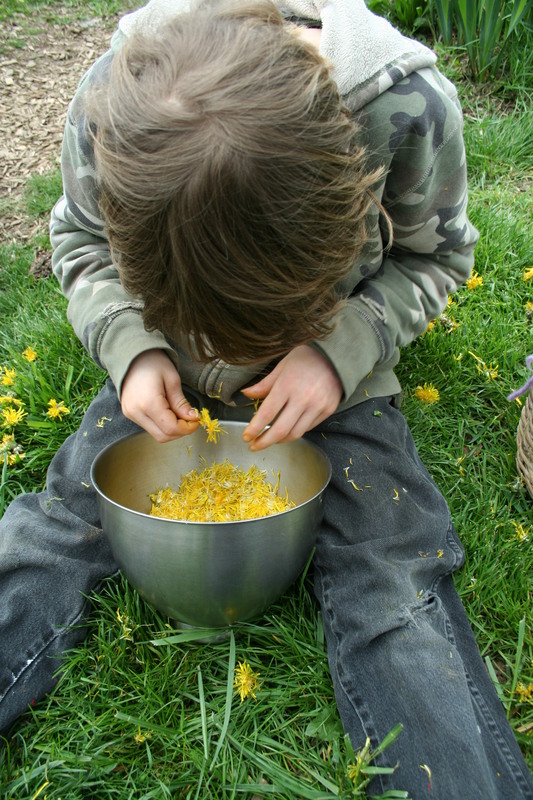 Do you have a recipe for Dandelion Jelly?